The letter formation stencils are made of Propene Polymer, Reusable and washable, easy to clean & use. Can be used for scrapbooking, gift card, diary graffiti, craft, bookmark, school project and any other project. 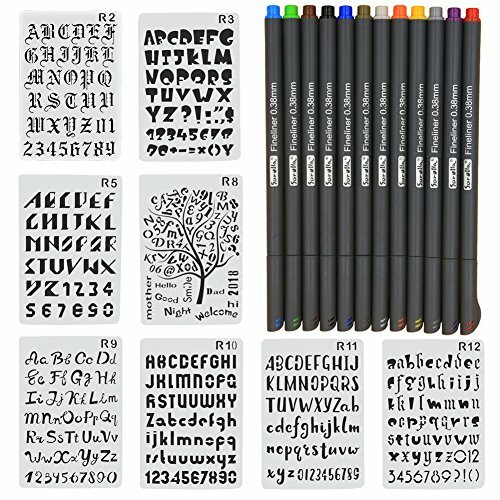 Package Included: 8 style bullet journal stencils and 12 fineliner color pens.The pens is 0.4mm. About Pen: 12 different colors, Minimal ink exudation, rapid drying, bright colors, Acid-free /Non-toxic Ink, water-based ink, beautiful and durable. The journal stencils are made of soft plastic Eco-friendly PET material, safe, reusable, durable and washable. Wide Application: Great for journal decorating, scrapbooking, wall stenciling, fabric decoration, cake decoration, airbrushing, making photo album card, wood burning and more DIY creation. If you have any questions about this product by ERUQ, contact us by completing and submitting the form below. If you are looking for a specif part number, please include it with your message.